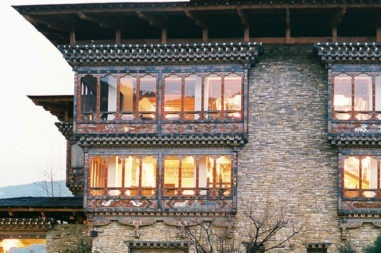 Thimpu Festival Tours, as the capital, is a unique blend of the modern and the ancient. 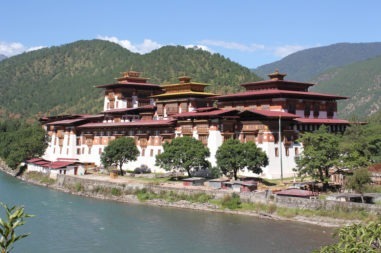 The bustling modern town is surrounded by ancient temples and the Tashichhodzong, the seat of the government and the monastic order. The Tsechu / festival are a religious festival in honor of Guru Rinpoche, who brought the Buddhism to this country in 8th century. The Bhutanese dressed in their finest clothes, come from all over for the festivities of the Thimphu Tsechu. It is believed one who witnesses the festival/the tsechu will bestow with much luck, they gain merits and their wishes are realized. The tsechu is also a yearly social gathering where people rejoice together. The Thimphu Tsechu or Thimphu festival is held in the courtyard of the Tashichho dzong. Since every year number of visitors, both tourist and Bhutanese are increasing very much, where all the people can not accommodate in the courtyard and the dance place is being constructed outside where more people can witness and enjoy the Thimphu Tsechu luxury. Most dances in the program have religious significance. Folk dance by the Royal Academy of Performing Arts is interspersed with religious or mask dance. 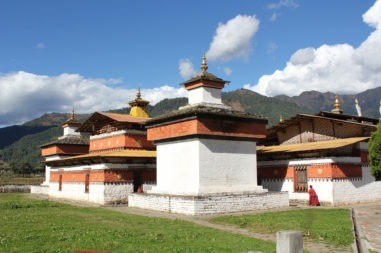 The Thimphu Tsechu was established by the 4th temporal ruler, Tenzin Rabgye in 1670 on the 8th month of Bhutanese calendar to commemorate the birth of Guru Rinpoche. Morning transfer to the airport(15 mins) for your departure flight. Our tour staff will bid you farewell at the airport. You can choose your dates at the time of booking. Thanks!